We turn into the driveway of the church parking lot accompanied by the slight whine of discontent of my eldest son, who I am certain would rather skip this detour and head for home. My youngest is peppering me with questions- “Mommy, what year did you and Daddy get married?” and “Was I here?” (nope, not even close), and with his usual enthusiasm he embraces our little side trip, eager to see inside the place where it all started. We get the kids out of the car and bundle up against the frigid, windy day, hiking up the hill to the small white building waiting for us, explaining to Zach that most likely it will be locked and we’ll only be able to peek in the windows. I share with him that many of his relatives are buried here and he immediately wants to see them, but Justin once again makes his displeasure known and I continue to hustle them up the flagstone path. It is closed to us as we expected, but I am able to point out where my fiancé and I stood to make our vows to one another, am able to show him where his relatives sat, how solemn and beautiful is this sacred space. Just as we are about to turn away the minister hails us from down the hill, and as he approaches we tell him we were married here and ask to go inside. Luckily he has the key, and after a short lecture about the history of the church we are left to roam. Justin settles himself in a pew as my other son and now husband wander around, and I step up to the altar where I stood twenty years before, my thoughts turning back to the joyful life I’d thought I’d lead. I’d believed it would transpire in DC, with a career that would progress from teaching to administration. It would include two kids sometime down the road, and hopefully some continuation of the path we’d built for ourselves which included travel, friends, and all the culture the nation’s capital had to offer. My vision was of a simple life filled with love, family, friends, and laughter, nothing extravagant. Things didn’t quite turn out as I’d expected (understatement of the century). We did have those two fabulous kids, but the career and DC were shelved so that I could do thirty hours a week of therapy with my toddler and the location shift was for better services and to be closer to family. After fifteen years in Virginia we had to reinvent ourselves in New Jersey, living not far from my old stomping grounds but far enough to have to start over. Frankly, nothing worked out as I’d planned. My Plan A was shelved for Plan B (and honestly C and D often came into play too). I traded working and mothering for hours on the floor begging my eldest boy to make a sound. I relinquished Mommy and Me to navigate the murky waters of Virginia Early Intervention. Playdates in the park were put aside for training sessions, internet research and making gluten-free chicken nuggets from scratch so my eldest son would eat. The landscape of our lives looked nothing like I’d thought it would. 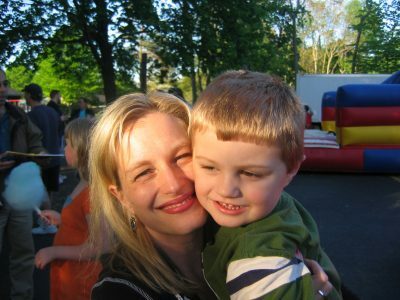 Two years after relocating, after a year-and-a-half of the absence of all the signs of autism our eldest had displayed we watched our youngest regress, relinquishing his precious words, losing the light in his eyes. This time at least we had help, and I reveled in the novelty of having trained personnel to help me coax my son back, praying to see his ebullient soul once more. In time, he returned, altered, but still irrevocably, beautifully, him. If anyone had told the girl standing so expectantly at that altar that at fifty she’d be a stay-at-home mom with two autistic kids living large in the Garden State, I’m sure she’d have laughed. You see, that so wasn’t the plan. But we all know the saying about the best laid plans. My husband and I now have two autistic kids in double digits, one who will need lifetime care, and one who will care for himself. Between the two boys together we have endured their insomnia, sensory issues, and aggression. We have seen milestones quite different from the ones we expected achieved and celebrated, and have learned to let others go. We have witnessed the loss of language, and its heralded return. We have watched with almost unbearable pride how our boys have mastered many challenges, both with strength, and grace. We have held each other and cried from fear for their futures. We have held each other and cried tears of joy from who they’ve turned out to be. This life was most definitely not the plan. But there is beauty here, and solace in the sanctuary we’ve been able to provide the boys so they can become their best selves, whatever that will be. There is still family, friends, and laughter. I turn to embrace my son as he leaves the confines of his pew, and for this former blushing bride, it is enough.